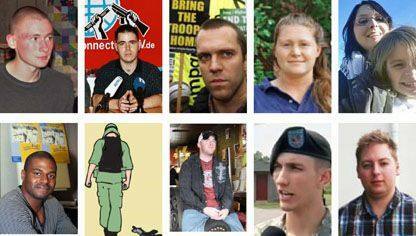 (13.10.2009) Attorneys and veteran’s groups are alarmed by recent reports that two US Army soldiers imprisoned at the Fort Lewis Regional Correctional Facility (RCF) have been subjected to human rights abuses and violations of their constitutional rights. Travis Bishop, who has served a tour of duty in Iraq and is now recognized by Amnesty International as a "Prisoner of Conscience," resisted deployment to Afghanistan. The other soldier, Leo Church, recently went absent without leave (AWOL) from his unit in order to prevent his family from going homeless. The civilian defense attorney for both soldiers, James M. Branum, told Truthout that both soldiers have been strip-searched while possibly being filmed. Bishop and Church have also been watched by female guards during strip-searches, while using the restroom as well as while in the showers. Both soldiers have been denied one in-person visit by their attorneys and all phone calls with their attorneys have been illegally monitored by guards. Branum reported, "The Fort Lewis Brig is violating the constitutional rights of my clients, namely their protections under the Eighth Amendment (the prohibition on cruel and unusual punishment) and the Sixth Amendment (the right to counsel). This mistreatment must end." Seth Manzel, a Fort Lewis Stryker Brigade veteran and executive director of the veteran support group G.I. Voice, said of the matter, "These techniques of sexual humiliation are far too similar to those practiced on foreign prisoners at Abu Ghraib in Iraq and Bagram in Afghanistan. Is the Army at Fort Lewis using enhanced interrogation techniques to break down American soldiers here at home?" Manzel, speaking with Truthout via telephone, said his group wants people to know that these abuses are occurring against soldiers "who signed up to defend the country" and "the idea that we do this to our own soldiers demonstrates how amazingly barbaric this system is." Other attorneys and military veteran bloggers have long commented on reports of human rights abuses in the RCF, including the use of female guards to sexually humiliate prisoners. The reports include the 2005 case of Michael Levitt, who plugged up his cell toilet in response to reported sexual humiliation by guards, and was then chained to a "stress-chair" (with metal frames, but no seat) for 109 hours. Other war resisters, such as Sgt. Kevin Benderman and Spc. Suzanne Swift have been held at the Fort Lewis RCF. Manzel, who also helps run the GI resistance coffee house near Fort Lewis, Coffee Strong, added, "We’re trying to raise awareness and give direct support to these two men. Ideally, we hope to pressure the leadership at Fort Lewis to respect their basic human rights, so that the leadership, courts, and other soldiers on base know that there is support out there for other soldiers who resist." On September 28, Truthout reported that both soldiers had been held incommunicado, which violated their Sixth Amendment rights. The Sixth Amendment is the part of the Bill of Rights that sets forth rights related to criminal prosecutions in federal courts, and reads, "In all criminal prosecutions, the accused shall enjoy the right to a speedy and public trial, by an impartial jury of the State and district where in the crime shall have been committed, which district shall have been previously ascertained by law, and to be informed of the nature and cause of the accusation; to be confronted with the witnesses against him; to have compulsory process for obtaining witnesses in his favor, and to have the Assistance of Counsel for his defense." According to Branum, guards are monitoring his conversations with the soldiers, in addition to the fact that the room at Fort Lewis where they meet is not soundproof. "The guards say we don’t have the room set up yet, but the problem is they had the new brig as a grand opening in August," he explained. "But the attorney room is not set up. So they need to be transferred to another building where we can have private conversations." "The last time I talked to Travis on the phone, he was telling me there was more issues of abuse, but he couldn’t go into detail with me since our conversation was not private," Branum added. Attorney LeGrande Jones, who practices in Olympia and was designated by Branum as the local counsel for Bishop, was also denied access to Bishop. Branum said that the soldiers’ Eighth Amendment rights had been violated as well. "The Eighth Amendment prohibits cruel and unusual punishment," Branum explained to Truthout, "You can’t use sexual humiliation as punishment. In the civilian world, it would not fly to have female guards watching over men using the shower. There’s just no reason to use guards of a different gender to do this, particularly when the military is so male dominated. It’s really weird that they are doing this at Fort Lewis." Branum said that Leo Church had been strip-searched in a room while told that cameras were running. Bishop is in the brig for having gone AWOL from Fort Hood, Texas, on the day of his deployment to Afghanistan to give himself "time to prepare for my application process." He was away from his unit for about a week, during which he drafted his CO application and sought legal advice. He returned voluntarily and on his return to the unit he submitted his application, but was court-martialed even as the Army was still reviewing it. Church was imprisoned for having gone AWOL, which he did in order to prevent his wife and children from becoming homeless. He tried to get help from his unit, but was denied, and received eight months prison time. Church was eventually forced by this ordeal to give his newborn son up for adoption. According to Church, "With everything that was going on, from me leaving, even though it was to care for my family, because I could find no support from the Army, Amanda and I had to place our son, Austin in a loving home through adoption. We did not want him enduring the strife that we had endured and for him to end up being fatherless, because I would be living in prison." Andrew VanDenBergh, a Marine veteran of the Iraq war and a G.I. Voice staff member, said of Leo Church in a press release, "He joined the Army, found out his family was homeless, wasn’t allowed to keep his children from living on the streets, went to take care of his family, had to give a child up for adoption and is now locked in prison and being abused. Being abused for what? For taking care of his children?" Fort Lewis continues to be a center of controversy with the recent revelation that a civilian security employee has been spying on groups opposing the shipment of Stryker combat vehicles through local ports.